Posted in: Art, Music, Photography. Tagged: 30th Dynasty to early Ptolemaic Dynasty, ca. 380-250 B.C.E., Egyptian, gesso and gilding, Inner Coffin of Meret-it-es, Late Period to Ptolemaic Period, Nelson-Atkins Museum of Art, Osiris, pigment, Ray Manzarek, The Golden Scarab, Wood. 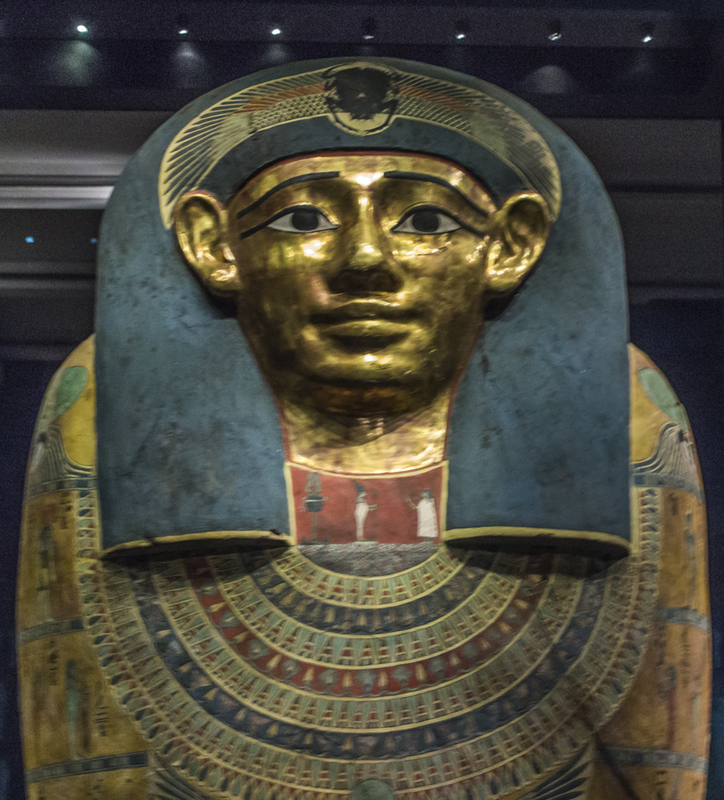 Except for her missing mummy, almost everything buried with the noblewoman Meret-it-es is here: this inner coffin, the outer coffin that contained it (to your left), the gold that lay over the mummy (ahead to the right) and 305 statuettes (behind you). Although little is known about Meret-it-es, her funerary equipment reveals much about Egyptian religion. Remarkably thick and weighing 400 pounds, this coffin was meant to preserve Meret-it-es's mummy so that her spirit could live eternally in the hereafter. In part, to ensure that she would become a divine spirit, she is portrayed as a god with golden flesh and blue hair; her unarticulated body resembles the mummified ruler of the underworld, Osiris. In the center of the coffin the sky goddess Nut spreads her wings, protecting Meret-it-es. A bit below this, Meret-it-es appears before the ibis-headed god Thoth, having been accepted into the hereafter. High above, on the red plaque, she approaches Osiris: her journey into the next world is complete. Imagine the artist skill that went into this. Beautiful!